Fed by the river Valouzin, the Moulin des Arbillons, which functioned until 1870, is a nature paradise. 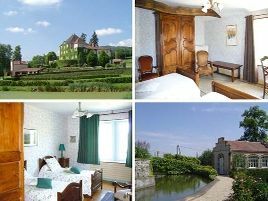 Celebrated by the poet Lamartine, the present building was constructed around the old 18th century mill and sits within beautiful landscaped, flower-filled grounds. The spacious rooms, charged with history, are elegantly decorated with lovely antique furniture. At breakfast your hosts will be happy to share their tips for visiting the region with you. A warm and attentive welcome..
- pêche sur place. - golf de la Salle ou golf de la Commanderie à 20 km. 5 rooms with bath or shower and WC. 95 euros (2 pers.). 1 gîte also for rent. sortie autoroute Mâcon Sud, dir. Cluny par la N 79 puis la D 22 dir. Tramayes. The closest station is Mâcon-Loché TGV, located at 20 km. The closest airport is Lyon Saint-Exupéry, to 100 km.